Today's readings remind us of God's commandments and love. In the first reading, we read of Peter taking his leadership role of the Church as the first Pope. He speaks of God as showing no partiality. God does not have any favorites (Romans 2:11, Colossians 3:25). He treats everyone equally and does not judge anyone based on appearance, only what is in the heart (1 Samuel 16:7, Jeremiah 17:10). This is important especially in today's world where the word "equality" is being thrown around a lot. Instead of picking favorites, God looks at those people who fear Him or respect Him and who are righteous (Proverbs 15:9, 1 Timothy 6:11). Now this does not mean that God only pays attention to the good people because remember, all have sinned and this includes the good and the ones who persist in sin (Romans 3:23). Rather, God pays close attention to those who while still in sin, try their best to be righteous and holy. He still does pay attention to those in sin waiting for them to turn around (Isaiah 30:18, Romans 11:32). No one is going to become a saint overnight. It is a process that entails God's grace and a response to that grace with faith and good works (James 2:14-26, Romans 3:24, CCC Article 2 Grace & Justification). This grace is open and free to all peoples, both the Jews and Gentiles. This is why the circumcised believers or the Jews were astounded that the gift of the Holy Spirit was poured out onto the Gentiles. God wants all to be saved because all humanity are His children (1 Timothy 2:4, Hebrews 2:14). This is why Baptism should not be denied to anyone. Peter clearly states that water for baptizing these people should not be withheld. It is in baptism that we die in Christ to then rise in Him (Romans 6:4, Colossians 2:12). In Baptism, God's power removes original sin and prepares the soul for spiritual growth as we read in the responsorial Psalm. In the responsorial Psalm, we read of God's saving power being revealed to the nations. God has always willed that all be saved starting with Abraham who became the father of many nations (Genesis 17:5). God has worked wonders with Israel in order to prepare the rest of the world for Christ (Isaiah 40, John 20:31, Acts 13:29, Matthew 26:56). Christ would come to redeem the world and open the doors to heaven for all peoples (Titus 2:14, Galatians 3:13). In order to be part of this salvation from Christ, we must follow His commandments. Loving one another is one of these commandments and what the second reading tells us about. The second reading beings with "let us love one another because God is love." As Catholics, we must love one another. This does not mean fellow Catholics only, but everyone, including those who hate us (Matthew 5:44). 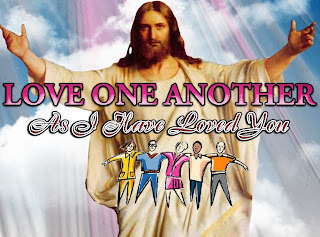 Christ wants us to love one another as we love ourselves (John 13:34-35). We cannot be the true image of God if we hate one another because God is love and we cannot reflect something that is contrary to God. This can be extremely difficult since there are some people in our lives that we sometimes want to push down the stairs or under a bus. However, this is our fallen human nature thriving on concupiscence. We must ignore these impulses and offer them to Christ on the Cross. It is not easy getting along with others since each person is an ego with different views, experiences, understanding, temperament and so forth. However, we must ask God for the grace to understand other people and be patient and forgiving with them (Ephesians 4:2, Colossians 3:13). If we love one another, we truly show that we are of God and know God. This theme continues in today's Gospel. In the Gospel, Jesus tells the disciples to love one another as the Father loves Him. In other words, this love must be genuine and perfect, without ulterior motives. This is done by following the Father's commandments and not our own desires which often seeks to trump the will and lives of others. Jesus then tells His disciples what true love is and that it entails the laying down of one's life for his friends. He was referring to Himself on the Cross. This does not mean that we have to die just to show our friends that we love them. However, it does mean that love of others should not be selfish (Philippians 2:3). This week New York City's Police Department buried one of its finest. Young police officer Brian Moore only 25 years old was shot and later died of his wounds doing his job: to serve and protect. Detective Moore (he was promoted posthumously) paid the ultimate price for the job he always wanted; to be a police officer. While his loss of life is not exactly the "laying down of one's life" as Jesus described, nevertheless, it similar in that as a police officer he had a job to serve and protect his community. Furthermore, Jesus tells His disciples that they are no longer slaves, but His friends. By using the word slave, Jesus means servants since He is King and royals often have servants (John 12:15, 1 Timothy 6:15, Revelation 17:14). This statement is a powerful one indeed. Can you imagine being the friend of a King!? This friendship also applies to us who are baptized in Christ and are given grace freely. In turn, we must respond with genuine faith and good works which comprise of loving one another. May Jesus Christ be praised forever! NOTE* In light of today's readings on loving your neighbor as yourself, please consider helping me expand this work by donating at www.gofundme.com/sacerdotus. With your donation, I can expand this work and help spread God's love and the Church's teachings to a wider audience. Thank you.